How Can CBD Help Your Anxious Dog? Go to any dog park and most likely, you will overhear someone talking about CBD for dogs. Plant-based CBD is the new natural product for our pet’s health & wellness and it’s just about everywhere these days. Similar to the ways that Cannabidiol (CBD) has become popular with humans, CBD for dogs is a very hot topic. Sometimes dogs become uneasy due to loud noises (thunder & lightning, fireworks, nail guns used during construction, etc.) while other times, undue stress can be caused during travel or going to the veterinarian’s office or groomer. No matter what the circumstances are, it is hard to watch our pets suffer. So how can CBD help with your anxious dog? Well, there is hope as Green Gorilla CBD products are non-psychoactive (that’s right, no THC) and made with all natural ingredients. Your furry friend gets the benefits without the buzz. Some pet owners love the lamb-flavored dog treats, both for their small dosage and yummy flavor, while other owners prefer the higher concentrations that the CBD oils provide. It all comes down to the effect you are trying to have on your pet, for example a 150mg Pure CBD Oil would be perfect for wellbeing, while a 1500mg would be best for tranquility. How do I know what the right dosage is? We recommend starting your dog with the smallest dose possible for its weight so that you are able to slowly introduce CBD to your pet and monitor his/her reaction. 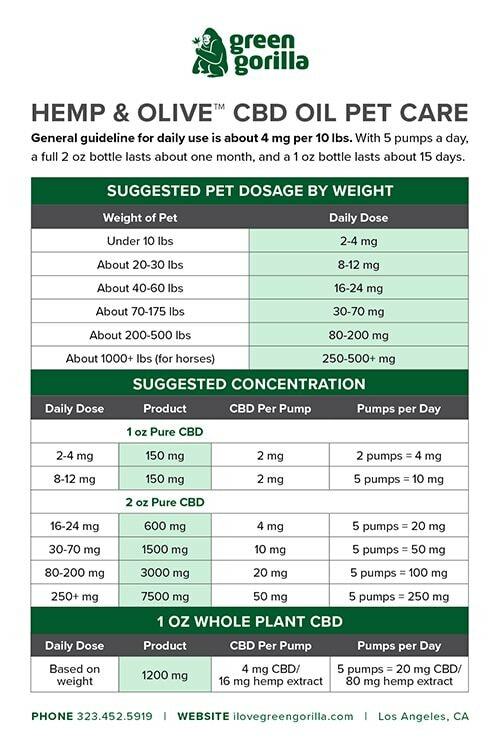 Using general guidelines for 4mg of CBD per 10 lbs., please use this chart to determine the appropriate dosage and see which product concentration might be right for your dog.